Happy Aquarium actually had its new demo tank up yesterday, but it was somewhat empty and obviously still being constructed. You've gotta wonder whose job it is to decorate a virtual aquarium week after week. But it looks like everything's settled down in the tank for today. 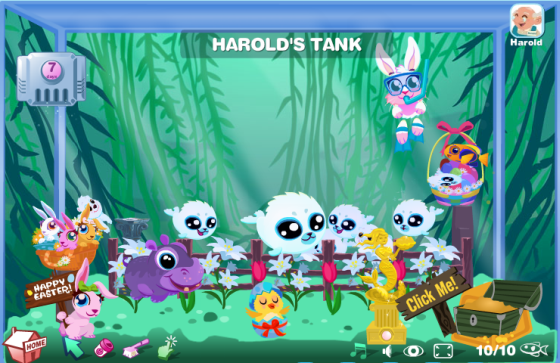 In it, you can catch a glimpse of the recently released Easter-themed items, and the new Lost Baby Hippo. This new Baby Hippo is purple and male. Like most of the Lost Babies, you can only get one if another player posts a notice about it on the Wall of their Facebook profile. You also only get one per post, so if someone else clicks on the link first, you're out of luck. But it's for free. You can also mate the male Baby Hippo with the female Pink Hippo, but it'll cost you Pearls instead of Coins to do it. The Pink Hippo can be bought from the store for 58 Pearls or 48 Facebook Credits.